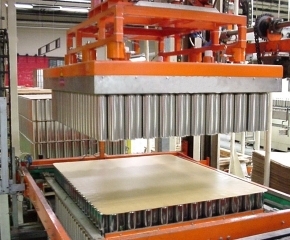 Goudsmit palletization magnets make use of magnetic force to lift and hold a group of ferromagnetic products, all at one time; they make use of permanent magnets, so no power is required. Because they are not dependent on power, a layer of products remains hanging as long as necessary. Suitable for: picking up tins, aerosol cans, drums and glass jars with steel lids. 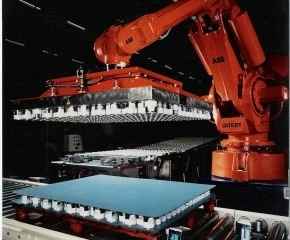 Application: automated processing for packing and unpacking using a robot arm or gantry crane. Max. dimensions: approx. 1420×1400 mm. Switching: automatic, via a pneumatic controller.